I am excited to share a wonderful – and healthier – alternative to the traditional flourless chocolate cake dessert. 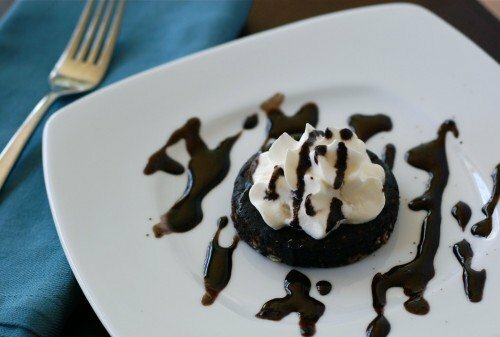 This dish can be served as small round tortes topped with whipped cream (or homemade ice cream) and chocolate sauce or you can simply turn the recipe into little individual chocolate truffles. I have a big sweet tooth so there’s rarely a day my fridge doesn’t have some of these in it! They are the perfect way for me to get my chocolate fix when I need one. Plus the chocolate sauce is not only good with this dish, but I’ve also drizzled it on homemade vanilla ice cream and used it to make hot chocolate for my girls as well. When you are doing the “100 Days of Real Food” pledge you must make do! This makes about 4 cakes, or 12 - 14 truffles. Using a frying pan, melt the butter on medium-low heat and add the pecans to the pan. Pour in the honey and cook until the nuts brown slightly, about 3 – 5 minutes. Be very careful not to overcook the nuts because they can go from perfect to burnt very quickly. Once the pecans are done blend them in a food processor with the pitted dates and cocoa. Add 1 – 2 teaspoons of water or just enough to help the mixture stick together a little. For tortes: Take out the chocolate mixture with your hands and flatten it out into one 1/2" thick piece on a cutting board. Using a round cookie cutter or drinking glass turned upside down cut out circular shapes for the tortes. 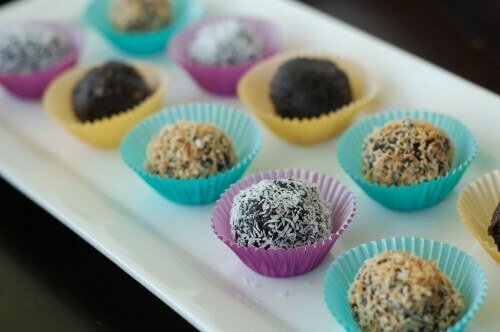 For truffles: Roll the chocolate mixture into little ball shapes with your hands and coat them with plain or toasted unsweetened coconut if desired. Keep them in your fridge for whenever you need something chocolate! I just used the choc sauce to make choc milk and the kids loved it! Delish! Every monday is choc milk night. I have been using the organic ah!laska syrup. It is made of evap cane juice, cocoa pwdr, xanthem gum to thicken vanilla and citric acid. What do you think of the cane juice? Also what abt agave syrup as a substitute? i made these tonight, and my 1 year old was in heaven!!! We’ve been eating Lara bars for weeks, and now we can make our own! WINNER WINNER CHICKEN DINNER!!!! This was sooooo good! Man, I am really loving the fact that I can eat butter and lard on the 10 day real food journey!!! Oh my these are amazing! I was lucky enough to try at a friends house today! She told me about your site and I simply love everything! Have made banana bread and breakfast cookies…wonderful! Cannot wait to get some dates! Once the can is chilled, the coconut solid separates from the liquid. drain the liquid and put the solid in a bowl. Add stevia or xylitol to your sweetness preference and stir until smooth. Can you make the chocolate tort balls without any nuts? I don’t think it would be the same w/o nuts…but if you have allergies you could try sunflower seeds instead. I’m out of pecans, but I have cashews and almonds. Would one of them be a good substitute? tks! I have not tried another nut, but go for it (maybe even do a mix of the other two). I bet it would be good! Hmmm…how about crushed whole-grain crackers to add some saltiness? Or crushed nuts? What is the difference between cacao and cocoa powder? Would the cocoa be considered real food? This recipes is amazing!!!!!! I just Gave it to my girls and they LOVED it! Thanks for bringing awareness to my family! How do you store the chocolate syrup/sauce after you make it? Just made it for my kids and they love their chocolate milk even more now. Oh good! Glad they like it. I store it in the fridge since that is what it says to do on the maple syrup bottle. I don’t have a food processor. What else could I use? Thanks! I am so happy I found your site! Maybe a knife and lots of fine chopping?? :) Sorry I haven’t tried it without a food processor! Do you have a blender? Maybe you could use the pulse button or chop button. Thank you, thank you, thank you! I am a chocoholic and I’m supposed to be avoiding refind sugar and yeast. This recipe makes little bites of heaven (that are very filling, I might add). While I love pecans, my daughter is allergic. She is not allergic to peanuts, so I made them with peanuts. They turned out very well. I’m sure other nuts or even seeds would work well. I just made the chocolate sauce using only 100 percent pure dark cacao and 100 percent pure maple syrup. I put some in my son’s milk, and he LOVES it! He only gets chocolate milk on the weekend, but I let him test it out today and he can’t wait to have it again. It is delicious! I took a look at the ingredient list on the chocolate syrup that was in the pantry and immediately threw it away! Hooray for small victories! I made these with regular cocoa powder (all I had) and with almonds since I’m allergic to pecans. They are AMAZING–I can’t stop eating them!!! I tried to purchase heavy whipping cream and every one of the three brands had carageen (sp? )in it. Where can I get heavy cream without this in it? Any thoughts? Just made these. I’m obsessed with the Chocolate Chip Cherry Torte Lara bars, so I added a few chopped dark chocolate bits, and raw cashews (since it’s what I had on hand.) Mine were SUPER sticky…almost hard to handle/form. They’re in the fridge now..I’m they will form better. Anyone else have this issue? Have you attempted using the chololate sauce for chocolate milk? I’d like to find an alternative to ovaltine. Are those regular cupcake liners in the picture or some smaller version? If smaller version, where did you find them? Thinking of doing these for a Christmas party. Thanks! Just keep in mind that those little papers are colored, and could bleed some into your food. My kids are sensitive to artificial colors (ADHD) so we stick with white if we need such. I made the zucchini bread recipe last night and just used a coconut oil spray on my muffin tins. My child has a nut allergy, what would you recommend to use to sub out the pecans? Thanks! I really want to make these, NOW, and am out of dates…do you think raisins would work?! I used honey instead of the maple syrup and added a little vanilla. It was really good, even the daycare kids loved it to dip their graham crackers in! I have the fancy medjool dates from Trader Joes. Are these the same as dried dates? They don’t say dried, so I wasn’t sure. Thanks for your help! Substituted raisins for dates (because that’s what I had) and walnuts for pecans (because that’s what I had). Yummy! Hoping these satisfy my chocolate sweet tooth! When you use maple syrup or honey do you buy it organic? I made just the chocolate sauce and coated almonds with it and roasted them. (Was craving chocolate almonds.) My girls, and even the neighborhood kid (who had never had an almond?!?) loved them! SOOOOO excited to try this! I just started cutting out processed sugars (and have been avoiding soy for a while) and I’ve been DYING for chocolate. Thanks! As I was going through the recipe index I noticed the chocolate sauce recipe. I wondered what was actually in the Hershey’s syrup that I have been buying for years and to my surprise (or not rather) I found high fructose corn syrup. Long story short I just made the chocolate sauce and I was absolutely amazed!!!!! I can’t tell the difference, and better yet my son can’t either… Thanks!!!! Hi! Thanks foe the great recipes. Could you use coconut oil or coconut spread to replace the butter in the tortes? Anything non-dairy? OK this is going to put me over the edge! Looks delish! Will definitely be doing this one. So glad I found this blog! Hey! Have you ever made chocolate using coconut oil and cacao or cocoa powder? I didn’t see a recipe, so I thought I’d ask. I want to start using more coconut oil and thought this would be a sweet addition! Holy Cow. I won’t lie, I didn’t think these were going to be that good. I have an embarrassingly untamed sweet tooth and sweets have been my “final frontier” of organic, real food eating. This recipe turned me into a 5 year old. After I made the truffles I was licking my fingers and scraping the bowl! They are amazing!! And so easy to assemble!I didn’t have pecans so I substituted 1/2 c peanuts and 1/2 c cashews, and I can’t have dairy so I used coconut oil instead of butter. I’m so excited to have a healthier option for my sweet treats! I’m just wondering if these can be frozen, just like cookies? Also, for how long they can sit in the fridge before they turn bad? Thank you! I made whipped cream today for the first time – seriously, SO easy! A great way to use some leftover cream from making alfredo sauce earlier in the week. I am wondering…I usually buy Hershey’s brand cocoa…either the sweetened or unsweetened kind. On the ingredients list it just says cocoa. Am I buying the right kind?? I noticed cacao is what is called for in this recipe but I’ve seen other recipes on this site that calls for cocoa and have also seen where lisa uses the special dark kind of cocoa in some other recipes. I guess my question is what is the difference between the cocoa that I’ve been buying and the cacao that’s called for in this recipe? I have looked online and the cacao is pretty pricey so just wanting to see what the big difference is so I know if I should or shouldn’t start buying it. I’m slowly trading out my unhealthy foods for healthier foods in my pantry and this is one I am wondering about. Thank u soooo much!! I LOVE this site and am on it every single day!! We have tried several recipes..including the collard greens we made tonight which was a big hit! These sound delicious cant wait to try- but I would like to encourage everyone to NOT buy Hershey’s cocoa- they were one of the first, and one of the worst offenders, to begin using chemical additives in their chocolate to make up for not using the more expensive real cocoa butter, and while they are supposedly phasing out the child labor factories, they are guilty of using child labor- there are just better chocolate companies to support! Can one use peanuts instead of pecans and is there a good substitute for dates, as well? I am allergic to pecans and just plain don’t like dates, but love the idea of this so much! Noelle, you can try any to use any nut (or peanut) you enjoy eating and just experiment with the recipe to find what works for you. Myself, I rarely have pecans around so I’d use raw cashews. Also, you can use raisins -golden or regular- as a sub for the dates. This might be a weird question, but I was wondering if there is a way of making whipped cream without milk (for those of us who can’t have lactose)? Thank you! Do you think I could add cocoa powder to the whipped cream to make it more visually appealing for the whole wheat cookie cake? Soooo delicious and super easy! Now I’m confident I can make the larabars too. Thanks so much for all the hard work, details, research and pictures that you guys put into this site and the food. Been trying several recipes and think I may be addicted to the site. Thanks again for all the great ideas. Hi- looking forward to trying this recipe, but my daughter is allergic to nuts. Could I try subbing in soy nuts, or do you have any other suggestions? Thanks! Hi Liz. You could use sunflower seeds. Hi there! I haven’t tried this exact recipe, but I’ve been using your chocolate sauce for a few weeks now. I’m so happy with it! I have one question about it though. Can you think of a way to thicken it up so as to use as fudge? I swirled it in my black bean brownies just now and they’re in the oven as I type. I’m hoping it will work out! Thanks again! Ugh! The pitted dates i bought are not dried! Would it still work? I will definitely be making these on the regular for energy snacks and sweet treat to have around! Would be fun to play with variations too… Maybe add some orange zest, some dried cherries along with the dates, maybe even a spot of kaluah or spiced rum for some extra festivity ;-) thank you thank you for this amazing way to help ease me into some real food snacks and sweets beyond just a piece of fruit… It was a revelation! I just made these. I learned I need a true food processor!! lol. I tried 3 different smaller things that I have, and they are not doing the trick! but, I will have to say, im happy I found this recipe, b/c they taste like the flavor larabars I love, chocolate chip cookie dough!! thank you!! This recipe looks fabulous but I don’t like nuts. What could be substituted? Hi Carol. You try seeds instead, such as pumpkin or sunflower. I am a chocoholic so Thank you, thank you for this amazing looking recipe. It popped up in my feed just in time for the holidays. We are on day 7 of our challenge! After an insane night with two 10 month old twins with ear infections I decided to make myself a treat. I used the whipped cream recipe from your book (1 cup cream, 2 tbs syrup, 1 tsp vanilla), added some strawberries and bananas, and was amazed that homemade whipped cream without sugar could taste so good. Next time I will start without syrup and see how that goes. Thankful for easy to make sweet indulgence. I made these today with raisins instead of dates (because I couldn’t find dates without added sugar at my grocery store – ughh!) and they turned out great and tasted wonderful!! These are so yummy and just enough chocolate to satisfy a choco holic! Curious for the truffles what would be a serving size recommendation? Hi Lydia. These are really rich. You’ll likely be satisfied with one. :) One to two would be reasonable. Has anyone tried these without the honey? I made them and really liked them, but they are sweeter than I prefer. I didn’t know if they would still stick together ok without the honey. These were so quick & so yummy! Next time I will double the recipe.